I know this has come up various times - still I'm not quite sure which version (Speedbooster) will work for the Pocket 4K and Canon EF. I don't wanna spend the money falsly. The 600$ already seem kind of ridiculous next to that cheap, beasty camera. Both work, however the 0.64x only works with full-frame lenses (but gives you a larger magnification and more light) whereas the 0.71x also works with aps-lenses. I would also highly suggest you look at the Viltrox 0.71x, as most people say the image quality is excellent and it costs about 1/5th of the Metabones. I know I will be comparing the two. Sean van Berlo wrote: I would also highly suggest you look at the Viltrox 0.71x, as most people say the image quality is excellent and it costs about 1/5th of the Metabones. I know I will be comparing the two. I've always been a little baffled by the lack or rigorous comparisons of the various focal reducers that are out there. If you go looking for comparisons, what you find are generally years/several product version old, or done by people with direct connection to one of the products being tested. There's lots of "Everyone knows such-and-such" and "I've heard that..." statements and very little hard comparisons. Always baffled me a bit. Every few months a new shootout or testing of some new ND filter or what have you gets done, but almost nothing rigorous for these kinds of lens adapters. I always support the outfit the developed the product to start with, and actually owns the design or tech inside, rather than someone else’s copy. In this case Metabones, with a proven track record in making high quality adapters are precision made, and will hold up to rigorous use. Why would you get the Gen4 adapter instead of the newer Gen5 which includes locking lens mount? Beyond the simple improvements to operation brought by new programming and the high-speed 32-bit processor, these fifth-generation adapters now feature rubber gaskets to protect the camera mount from dust and moisture entering, an LED light to show users the adapter’s current mode or status, and a dedicated switch that will control the in-body image stabilization of select Sony cameras. Also, the CINE models sport a positive-lock lens mount that holds your larger and heavier lenses more securely. Sean, there may be some confusion on the suitability of the focal reducers using the wider dimension of sensor on the BMPCC4K. People’s impressions of the focal reducers’s suitable taking lens may have been formed by their use on the BMCC or original BMPCC. But those sensors are significantly smaller. Here’s the current math normalized to the horizontal ‘crop factor’ which does come in handy for such quick comparisons. Comparing the sensor diagonal would be a little more accurate, but I don’t think the results differ. APS-H lenses suit cameras with a sensor crop factor around 1.2-1.3x (I forget). some full frame may work such as Zeiss CP2/CP3 and SLR Magic APO. Last edited by rick.lang on Fri Sep 14, 2018 7:57 pm, edited 1 time in total. Nice Rick, but it is the camera, and not the lens that has a crop factor. So MFT lenses do not have a crop factor, the cameras do, with the GH4/5 having the greatest, more than 2X, and the GH5/s and BMPCC 4K having the least around 1.9, as you later point out. Thanks for putting this together, gives a nice quick overview in one place. I’ll reword that post; check it out in a few minutes. Yay, I will get my Pocket! Now, even though Rick (thanks for that) has flawlessly listed the differences between the Ultra and XL. I - so far - only have full frame lenses, though I mostly shoot in the tele-range, which would speek for the Ultra with 0.71. Though the XL gives me a little more light. Has anybody had the chance to test them both? Are there any quality differences? I guess AF doesn't work on both of them so far yet? I've the Metabones Cine 0.71 Ultra and it works great with my lenses, except for AF - that does not work currently. The cool thing about the Cine is the positive lock. I have put the PCC4k into a 8sinn half cage and added their universal rod support and lens support to secure the Metabones adapter. Now lenses are sitting rock solid on the camera, even my heavy Tokina Cine 50-135 T2.8 sits nice on this combination. Janis, can think of two factors that come into play when considering Metabones SpeedBooster Ultra versus XL. But they’re a trade off potentially. Let’s assume the change in apparent focal lengths and aperture are not relevant, that both apertures and focal lengths are suited to your purpose. And let’s assume both SpeedBoosters are optically perfect. First, the line pair resolving power of your lens is increased using a focal reducer. So more true detail will appear in your image especially when using a higher resolution sensor. So that’s score one for the XL. Second, the wider your angle of view becomes, the closer you are getting to the edge of the image circle. Typically lenses are closer to perfect about the centre of the focus/frame. As you move away from the centre, some smooth degradation may be apparent. Somewhere nearer the edge and often in the corner, the image is noticeably degraded, perhaps with an overall softness or with chromatic aberration. The Ultra tends to keep you closer to the sharpest area and so score one for the Ultra in most situations. If you have a telecentric lens, your image will tend to look better from edge to edge, but these are not the typical lens design for budget lenses. So the more central area of the frame can be referred to as the sweet spot where your image looks best, just like keeping your iris around T2.8-T5.6 is the sweet spot for the lens. A telecentric lens and a XL may be the best combination for those who can afford those lenses. Also, the Ultra at 0.71 gives more useable standard focal lengths. Standard epS35 equivalent Video focal lengths for MFT (16:9) are 14, 17.5, 25, 42 and 50mm, with the later two your portrait focal lengths. So the 0.71 SB gives 17.5 from a 28mm (like the Zeiss 28mm f/2) 25mm from a 35mm, 42mm from a 60mm, etc. Do the math with your favorite focal,eights to see which one works better, given yiu are using FF 135mm lenses, and not APC/DX lenses, which restricts yiu to the Ultra. Now I would really appreciate an input from somebody using the 0.64 in real life and what their experience is so far If I'm correct the XL was concepted for the GH4/5 with x 2 crop instead of the pockets 1.9x crop. Wich metabones speed booster would get closer to the URSA mini pro? Ultra XL? Fran, the U,tea, with its 0.71 factor,mis the one that takes a MFT sensor to a very close field of view of the S35 sensor Cine Cameras. How close, will depend on which gate you are using on the UM 4.6 sensor and the Pocket 4K, full gate will be a little wider, UHD gate/crop will be very close. Neither will be an exact match, but rhe Ultra I feel is closer, having used this one on the AF100 to match S35 AOVs. Fran, congratulations on the set of SLR Magic APO primes. If you have not purchased a Metabones SpeedBooster and you are crazy about shooting with PL glass, you might consider the MFT-PL SpeedBooster. That way you’ll have a better chance of minimizing any play in the lens as you rotate the lens gears. Did you also buy the passive MFT-PL adapter from SLR Magic? I’ve preordered it, but not received it yet. I’d recommend it. 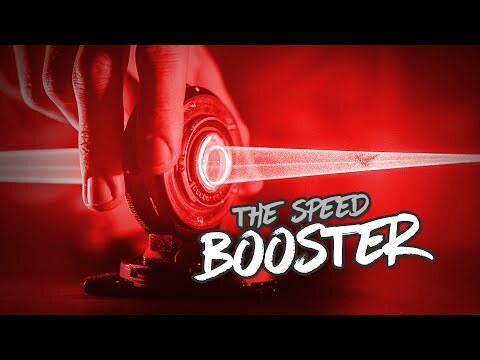 Let us know how things go with whichever SpeedBooster you get, but at this point I’m deferring the purchase of a SpeedBooster until 2019 as I’m bringing in some other toys to play with. Thanks a lot Denny and Rick! I have to say that the APO´s are very very nice! We are waiting for the 32mm. Nice graphic, Rustam. Your numbers look good. On,y thing missing is the Ursa Mini sensor gate size for a reference. With a horizontal crop of 1.42x, the URSA Mini 4.6K falls just a little inside the outer green area. 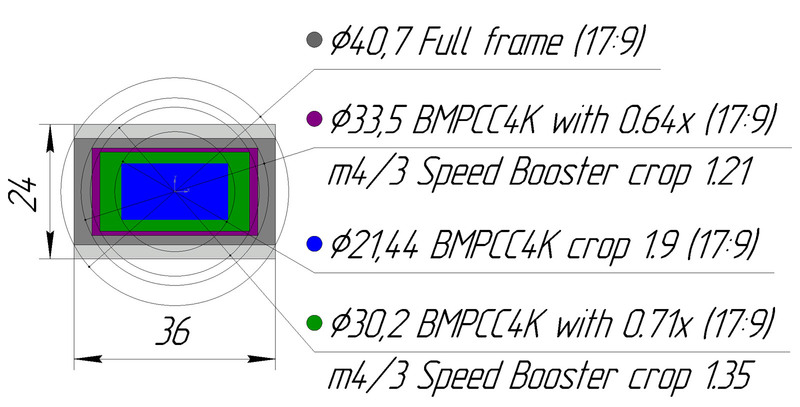 As you were recommending the SpeedBooster Ultra on the BMPCC4K is most similar to the Mini 4.6K. Thanks Rick, that is what I thought. Anyone had good results from the Aputure DEC Lens Regain? I got the 0.71 even though i only have full frame lenses. That’s what I would do as well. That’s will get you as wide or wider than the angle of view of the URSA Mini 4.6K sensor and you’re using the best part of the full frame lens. I use an Aputure DEC Lensregain Wireless Remote Adapter on my BMPCC 4K and it works with my EF-S Canon 18-55mm f/3.5-5.6 IS STM "kit" lens, my Canon EF-S 70-200mm f/4-5.6 IS STM lens and my Canon 20-35mm f/2.8L EF lens in window mode. The wireless transmitter supplies power to the image stabilization which works fine. It has a .75 focal reducer lens and provides wireless control of the iris and focus with 2 stops you can set and variable focus speed. The lanc control doesn't plug into the camera so there is no remote start and stop however. Although I have no experience using a Metabones Speedbooster, several people on the internet say the Lensregain's quality is on a par with it. It should be noted however that there is no electrical connection with the BMPCC 4K, so the autofocus and the iris control of the lens from the camera doesn't work. The Canon 18-55mm f/3.5-5.6 IS STM lens can be found on Ebay for about the cost of a quality UV filter. Best of all B & H has it on sale for $150, half the price of what I paid for it used. Being a compact unit, I intend to use it with a gimbal. Update on the Aputure DEC Lensregain. I just received a SmallRig Metabones Adapter Support for BMPCC 4K 2247 to provide support for the Lensregain on the Smallrig full cage. It worked fine. I also got the mount for the Samsung T5 to work on the second try after installing the Lensregain transmitter first. The first time there was no signal to the camera because the transmitter was too close to the T5 mount. I will order the remote cable to place the transmitter away so it doesn't ruin the socket. Just got my 4K with a meta .71 Nikon. I've got my 14-24 on there and I noticed in the menu that the window sensor with was on but greyed out. Does that mean the meta is kicking in the window mode for some reason? I was shooting 4k not HD in case it was a question. Robert Niessner wrote: I've the Metabones Cine 0.71 Ultra and it works great with my lenses, except for AF - that does not work currently. The cool thing about the Cine is the positive lock. I have put the PCC4k into a 8sinn half cage and added their universal rod support and lens support to secure the Metabones adapter. Now lenses are sitting rock solid on the camera, even my heavy Tokina Cine 50-135 T2.8 sits nice on this combination. I’m planning to buy the tokina 50-135 cine ef and also the metabones speedbooster cine 0.71 ef to mft. I’m wondering if the focus changes on this configuration when zooming? aglyons wrote: ... I was shooting 4k not HD in case it was a question. Were you shooting 4096x2160 or 3840x2160? Shooting raw or ProRes? Haven't used the 50-135 much with my PCC4k but as far as I remember it holds focus in this configuration. I am not Robert, but I do own that configuration and can confirm that it does not change it's focus while zooming. Here is some test footage of the Metabones with the Pocket 4K. He is comparing the Metabones to the Viltrox on the Pocket 4K, and he gives a quick visual comparison of the Ultra vs the XL! Search Youtube: Which Speedbooster for Blackmagic Pocket 4K ? Viltrox vs Metabones 0.71x compared ! I cant post URLS apparently. I agree with Rick. That was an excellent video. BH has the DEC Lensregain wireless EF to M43 focal reducer on sale for $199. dondidnod wrote: BH has the DEC Lensregain wireless EF to M43 focal reducer on sale for $199. I have this and so far it's been super solid on the P4k - although I end up mostly using manual primes and a follow focus instead of using the Lensregain's lens control. I got the Metabones canon adapter only for my Sigma 18-35mm and 50-100mm and the infinity focus is off by a lot. Without the glass is there a way to fix that? Michael, Nice professional looking short. Remarkable bokeh for M43 lens. What lens did you use? Did you shoot wide open? Did the Lensregain add any chromatic aberration that you had to correct in post? Smallrig has a new T5 SSD holder that fits inside a wooden handle for their P4K cages. It should solve the problem of a tight fit of the old SSD holder against the Lensregain's transmitter. dondidnod wrote: Michael, Nice professional looking short. Remarkable bokeh for M43 lens. What lens did you use? Did you shoot wide open? Did the Lensregain add any chromatic aberration that you had to correct in post? Donald, thank you! I was using a Rokinon DS Cine lens (35mm) and shot mostly at f/2.8, ISO 2000 (if I recall correctly on the ISO). 4k DCI Prores 422 (man, I'm looking forward to Blackmagic raw! I hope it's this month). I was very pleased with the look even in the low light. I did not have to remove any chromatic aberration. I wish I'd taken a picture of the frankenrig I was using: a Glidecam HD, with a rail system and remote follow focus, the P4k in a Smallrig full cage with a Sandisk Extreme SSD strapped on top, with a battery plate at the bottom of the Glidecam. But it worked well (although not fantastically balanced, but I'm working on that) and I'm sure I'll use it again soon! It was a lot of fun. I first considered the Lensregain a while back, but when the price dropped to $199, I couldn't help but give it a chance (compared to the $600+ Metabones). Rado Stefanov wrote: I got the Metabones canon adapter only for my Sigma 18-35mm and 50-100mm and the infinity focus is off by a lot. Without the glass is there a way to fix that? No glass in the Smart Adapter so presumably there’s no adjustment on the SpeedBooster that will vary the FFD. Correct, Rado? When you focus at infinity, is your focus before the infinity witness mark (like at a 60’ mark) or beyond the infinity witness mark (if the lens barrel allows you to go beyond infinity)? Last edited by rick.lang on Wed Feb 20, 2019 3:39 am, edited 1 time in total. Sounds like a bad adapter or the two lenses have a bad FFD setting. When you focus at infinity, is your focus before the infinity witness mark (like at a 60’ mark) or beyond the infinity witness mark (if the lens barrel allows you to go beyond infinitely)? So the adapter FFD is short of the required 24.75mm needed to make the MFT mount to lens the required 44mm EF FFD. Have yiu tested the lenses on another EF mount camera?